Developer 5th Cell returns to the world of Drawn To Life with the straightforwardly titled DS adventure Drawn To Life: The Next Chapter, picking up where the first game concluded, with a new brand of evil threatening the adorable Raposa. 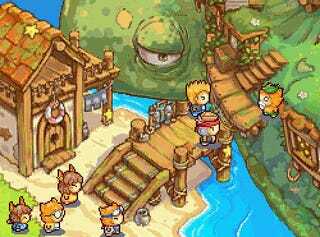 As in the first Nintendo DS title, Drawn To Life: The Next Chapter asks the player to tap into their artistic touchscreen skills to draw platforms, vehicles, weapons and even the game's hero itself—my ninja Musashi, armed with a giant corndog, is just one of almost limitless possibilities—who must return color to the desaturated world and rescue a missing Raposa named Heather. In both the top-down adventure portions and side-scrolling platforming sections, players will flex their creativity to make this Drawn To Life adventure their own. Should you apply your brush to Drawn To Life: The Next Chapter? Presentation & Animation: Everything that I didn't contribute to Drawn To Life: The Next Chapter via touchscreen and stylus looks spectacular. Artist Paul Robertson's amazing sprites animate beautifully, adding charm and character to the game's non-playable Raposa and enemies. Beautifully hand-drawn backgrounds have lush, well-animated detail, ensuring a welcome level of visual variety across the game's five worlds. Save for the clumsy characters and items I drew—I often let the game's suggested template sprites take the place of my own creations—the game is a treat to look at. Surprisingly Engrossing Story: It may not be wholly original, but the relatively simple tale of The Next Chapter has a few twists and a tender moment or two, made the better thanks to well directed, well scored cut scenes. The game's script is sharp and witty at times, dialogue I did my best not to miss. Da Blob: The platforming portions start to wear thin quickly, but the addition of two additional forms—the amorphous Blob and wall-crawling Spider—help break up the monotony of playing as a sword or yo-yo wielding Humanoid. There are some clever level designs, some not-too-difficult puzzles that require dexterous use of all three forms. Improved Creative Tools: Just about everything I crafted with Drawn To Life: The Chapter's graphics editor was an eyesore. But the tools have depth to them I've just begun to explore. A larger color palette and a wealth of interesting templates—plus the ability to add extra limbs!—offer the opportunity for a wide variety of cool or kooky creations. The "Action Draw" sections, which lets the player draw simple platforms using a limited supply, aren't particularly challenging, but they're fun. Extended Downtime: Conversations in The Next Chapter can drag on, leading to long stretches of watching, not playing. For the most part, the game is careful not to throw unnecessary monologues and long-winded explanations, but there are a few moments where the narrative starts to wear out its welcome. Mundane Platforming: The game's platforming sections are easy to blow through, offering little in the way of impressive level design or captivating challenge. There are, however, some well-hidden collectibles scattered throughout the game's 45 levels, but the drive to revisit some of these rather dull levels, especially with Drawn To Life's loose controls and sometimes spotty hit detection, is low. Drawn To Life: The Next Chapter's biggest strength is its creative tool set. It's a wonderful little artistic outlet, a gorgeously crafted game that plays like it would appeal to a much younger, more patient and passionate player. It doesn't offer much in the way of depth for the more experienced action-adventure fan, but makes up for some of its shortcomings with its copious charm. There's enough to do, see and collect over the course of the game's storyline to make the journey worth the while. It's just a shame that Drawn To Life: The Next Chapter's gameplay is its weakest link. Drawn To Life: The Next Chapter was developed by 5th Cell and published by THQ for the Nintendo DS on October 27. (A Wii version developed by Planet Moon Studios is also available, but was not reviewed.) Retails for $29.99 USD on DS. A copy of the game was given to us by the publisher for reviewing purposes. Played game to completion.